Yoga is one of the striking products of Indian mind and character. It has claims both as a system of practical discipline and a system of philosophical thought. 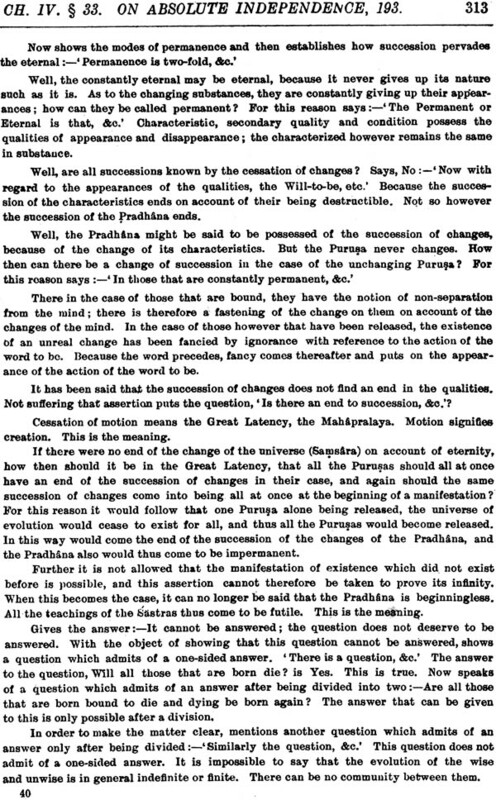 The present book Patanjali's Yoga Sutras, with the Samkhya Pravacana commentary of Vachaspati Misra, with English translation by Rama Prasada and an introduction from Rai Bahadur Srisa Chandra Vasu, forms one of the six Darsanas of ancient Indian philosophy. 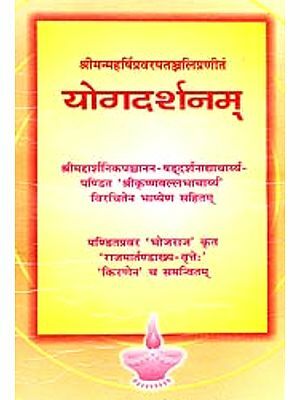 The main purpose of this book is to disclose the secret doctrines of Yoga, give the practical knowledge to the aspirant and guide him to the realization of the Individual Self to the realization of the Supreme Self. 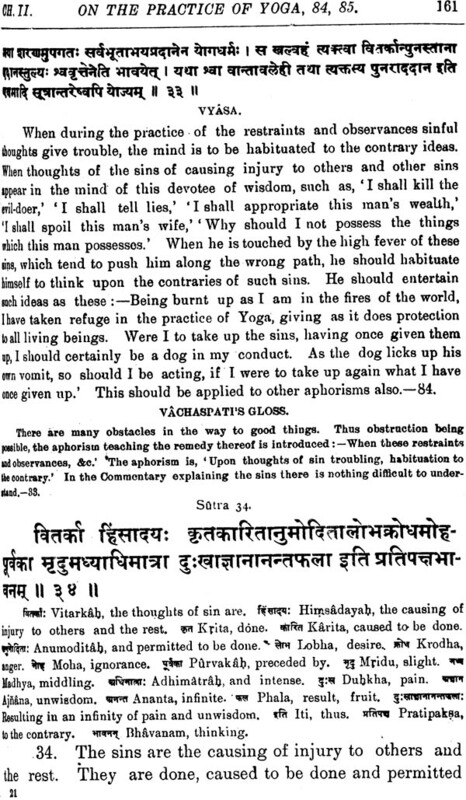 The aphorisms of Patanjali on the Yoga Sutras are contained in four chapters and are nearly two hundred in number. The author of the aphorisms is said to be the same Patanjali who wrote the famous commentary on Panini’s aphorisms, under the name of the Mahabhasya or the Great Commentary. Another work is also attributed to him——the great work on Medicine. If so, he was not only a great Grammarian and a great Philosopher, but a Great Physician. He prescribed for the body, mind and spiritall three. The age of Patanjali is now generally fixed at three centuries before Christ. The word Yoga comes from a Sanskrit root which means “to go to trance, to meditate." Others however derive it from a root which means to join; and Yoke in English is said to be the same word as Yoga. Both roots are feasible—in the case of the root to join, Yoga would mean the science that teaches the method to joining the human soul with God. The philosophy of Patanjali is essentially Dualistic. The Jivas or Purusas or human egos are separate individual entities and exist from eternity; so is also Prakriti, and so also Isvara or God. It thus believes in three Eternal co—existent principles, the God, the Man and the Matter. But man is found to be involved in matter, to have fallen from its pristine state of purity. The aim of Yoga is to free (viyoga) man from the meshes of matter. But the highest form of matter is mind—the C itta (a term which would include that which is technically known as manas, as Ahamkara and as Buddhi). 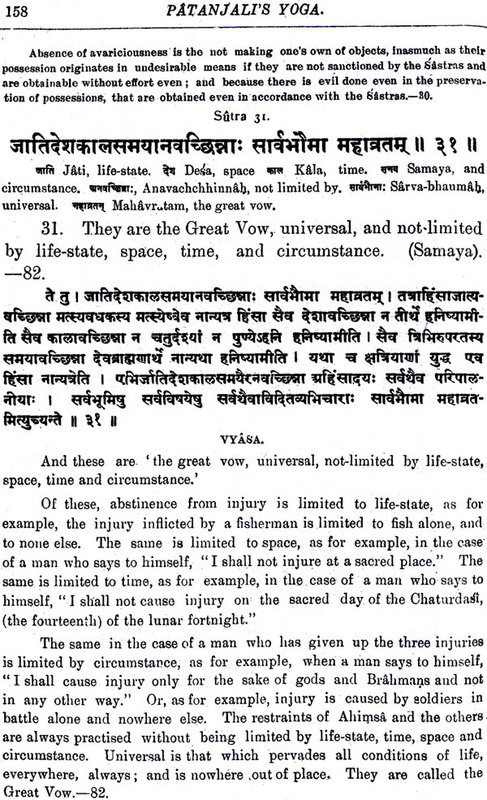 The students of Sankhya need not be told that the first product of Prakriti or the root-matter is Mahat or the Great P1•inciple—the Buddhi, then comes the Ahamkara or I—principle——the matter through which can function the I—ness: and then the Mamas or the matter which is the vehicle of thought. These three vehicles—the thought-vehicle (Manas), the I—vehicle (Ahamkara), the Pure-Reason- vehicle (Buddhi)——constitute Chitta or the subtlest form of Matter. To free man from the fetters of this Chitta is thus the problem of Yoga. The man when freed from all vehicles, remains in his own form called Svarupa. It is not made of Prakritic matter. It is the body which belongs to man—is part of man from eternity—the body in which he dwells in Mukti in super—celestial worlds. It is the body in which the Triune God is directly active-Isvara, Prana and Sri——or the Father, the Son and the Holy Ghost. 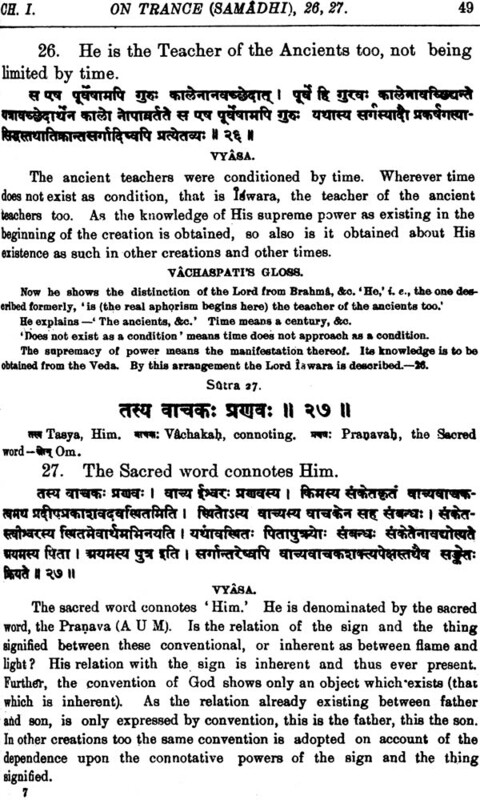 This svarupa—deha, is the body of Prana—the body of Christ of the Gnostics. This is the incorruptible undecaying body, the spiritual body. But when man is not in his Own—Form (Svarupa), he functions naturally in the lower vehicles, and his form is there the form of his vehicles ——whether it be of Buddhic, Ahamkaric or Manasic matter. In fact the man of Psychology is this triad—Ahamkara, Buddhi and Manas. The human consciousness in whatever lower body it may function is always a dual consciousness—it must he alternately pleasurable or painful. Pleasure and pain are the marks of consciousness functioning in Chitta. The Svarupa consciousness is only above all pains. Next to this primary division of all consciousness, as regards their nature ; the consciousness as regards its quality is live—fold:—(l) it may be a true consciousness of some objective reality—something which is out- side the man and his vehicles ; or (2) it may be an incorrect consciousness of outward reality ; or (3) it may be a hallucination ; or (4) it may be non- perception of anything external but of rest ; or (5) it may be the reviving of old perceptions. In other words, tl1e consciousness looked at from the subjective or emotional point of view is either pleasurable or painful; looked at from the objective or cognitional point of view it is—(i) true perceptions, (ii) false perceptions, (iii) hallucinations, (iv) sleep, and (v) memory. Thus both tl1e emotional and the intellectual aspect of the Chitta—or the Triune Man is to be checked. But how is it to be checked. The answer is by constant practice and want of attachment or Dispassion. There must be constant exertion to keep the mind on one point. This is called Abhyasa. The intellectual functioning of the Chitta is to be cheeked by Abhyasa putting the mind to think of one object, and as soon as it strays away from it to bring it back again to the same point. This practice or Abhyasa, steadily persevered in, would make the mind one pointed, with the help of Viveka or discrimination. As regards the emotional sides of the mind, it must be checked by Vairagya or dispassion. Pleasure or Pain, attraction or repulsion, love and hatred can be controlled only by this world—weariness—realisation that there is nothing in this world or the next worth striving after, worth desiring or worth hating. The highest form of Vairagya will be attained when one will realise his separateness from all Prakritic vehicles—when he can say “I am not Body, or Desire, or mind, or Reason or I-ness." The state of Samadhi or trance induced by Practice and Dispassion is two-fold—Samprajnata and Asamprajnata. In the first, the man has shut off from his consciousness all external impressions, but his internal self—initiated activities have not ceased. In the other, oven these are stopped. There are some entities whose consciousness is in a state of Samadhi naturally, wl1o have not to acquire it by any exertion. These are the classes of beings called Videhas and Prakritilayas. Their consciousness is cosmic. The Videhas are Devas. They are Mukta from the beginning: but in some future Kalpa they may come into the world cycle. 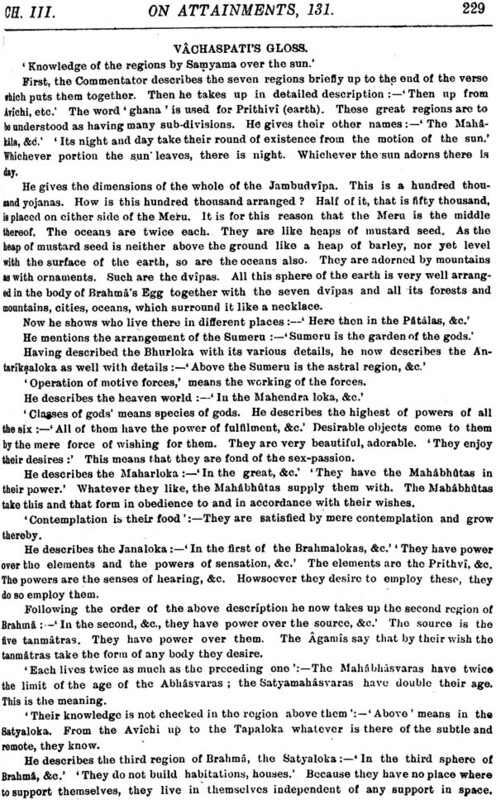 The Prakritilayas are Adhikari Purusas, tl1e great office-holders in the cosmic hierarchy. They are the perfect ones of the past Kalpa. In the case, however, of ordinary entities-for the Videhas and the Prakritilayas do not stand in need of Yoga— the method of suppressing Chitta—functions consists in having faith, energy, retentive memory, meditation and wisdom. One must cultivate these qualities in order to become a successful Yogi. The success is quicker according to the amount of energy put in by the person in his practice. But the best and the safest method of Yoga is the love of God. Loving God with all one’s heart and soul would quickly bring about the cessation of all mental functions. God is a spirit untouched by sorrow, action and its fruition. He is Omniscient, He is the Teacher of all, and from eternity. llis mystic name is Om. One must recite this Om constantly meditating on its letters and their imports; and thus all obstacles to concentration will be removed, and the Inner Self will manifest itself. The obstacles to concentration are disease, languor, doubt, heedlessness, laziness, sensuality, delusion, &c., mentioned in I. 30. But when the mind is concentrated, there is no pain or despondency, no fidgetiness, no difficulty of breathing. To attain concentration and remove these obstacles, the aspirant must practice to fix his attention on One Point, One Truth. Of course the highest Truth is God and so the constant attitude of the mind should be G0d~ ppinted. The aspirant must strictly regulate his conduct as regards others. He must show happiness and feel happiness when dealing with those who are happy. Let him have no feeling of jealousy towards them, He must show compassion towards those who are suffering. He must not be callous to the miseries of others. He must be complacent towards the virtuous, and hate not the sinner. These are the moral attributes that he must try to cultivate. There are, however, some particular methods which quickly bring about concentration; one of them is the regulation of the breath. The monotony of slowly breathing in and breathing out brings about hypnosis. Fixing the attention on various parts of the body, such as the tip of the nose, palate, &c., are also helpful. The astral senses are developed by this means, and when the practitioner gets first hand knowledge of astral sights, sounds, &c., his doubts are removed, and he feels more earnestness in pursuing the path. If the astral development is not wanted, the practitioner may concentrate his attention on the light in the heart: and upon the thought " I am." This also steadies the mind. Or he may fix his attention on some great and holy saint or sage- such as Zoroaster, the Buddha, the Christ, &c.
Or he may fix his attention on the objects of his dreams. Some- times in dream he may be shown a great Deva or a great Teacher. Let him not reject it as fancy. By fixing his attention on it he may acquire steadiness of mind. Or he may fix his attention on the ideas that pass through his mind just before he goes to sleep, the pictures that arise when one is half-awake and half-asleep—the hypnopompic (as Myers calls them). Or he may fix his attention on the pictures that one sees just before awakening—the hypnogogic. If he can fix his attention on these, he may easily pass into hypnosis. By such concentration all mental impurities are removed, and the mind becomes like a pure crystal that reflects truly and correctly all objects that are presented to it. They are no longer distorted pictures or dim and dull reflections of outer verities. The mental vehicle is purified, and the knowledge that now arises is far more true than any knowledge that he had before. 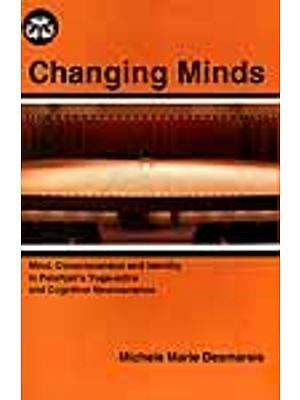 The mind, howeve1•, enters as an- element in every such knowledge, and the past ideas and memories tinge such knowledge. This state is called Savitarka mixed up trance. But when the mind reflects only the object, without adding to it anything from its own associations and storehouse, it is pure idea and is Nirvitarka Samadhi. In this state the light of the Self shines out on purified mind. It is not only a pure crystal that faithfully reflects the outer objects, but it is illumined, as if it were, by a light which was dormant within its own inmost centre. Such a mind is called the Truth- bearing mind. It has truth within it and truth without-a mass of truth —a tree carrying the fruit of truth—a female full with truth. Up to this time the objects of the mind were mere ideas and inferences, mere thoughts, Now the contents of the mind are things, the very things as it were, and not merely thoughts of things. The mind modifies itself, as it were, into the very thing itself; and thus the thing is known more truly and essentially than it was known ever before. In this state of mind, the time and space cannot impede the perception of the object. The object may be inside a box, behind a wall or hundreds of miles off, the mind faithfully reproduce it. The object may be the subtlest and the minutest, not visible even under the strongest microscope, the mind reproduces it. For it no longer depends upon the senses for its knowledge, but has become the all—senses itself. In this way the mind becomes the highest sensory:-— by constant practice the mind gets into the habit of reflecting the trance objects. But even this habit is ultimately to be conquered if one wishes to rise to the higher levels of what is called the seedless trance. 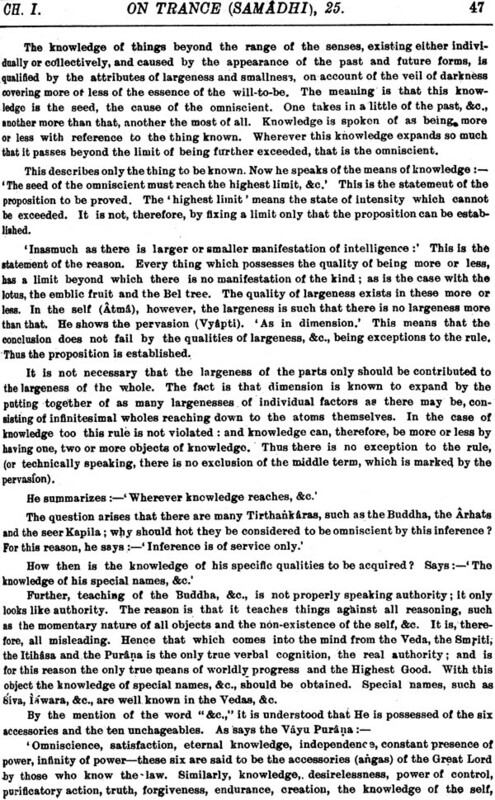 The First Chapter thus, in fifty—one aphorisms, gives what may be called the theory or the science of Yoga. 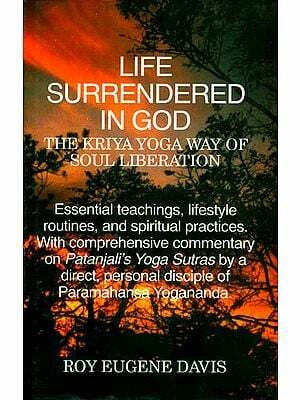 An ardent and intelligent person can learn enough from this chapter alone to become a practical Yogin. But for men of ordinary intellect, more detailed teaching is necessary. The Second Chapter enters into such teaching. It may be called the art of Yoga——the technique of it. The art of Yoga consists in bringing under control and purifying the three lower vehicles of man, namely, the body, the mind and the spiritual Self—the astrophysical, mental, and the causal bodies. The astrophysical body is to be purified and brought under control by what are called ascetic practices,-early rising, bathing, fasting, bearing hard- ships, etc., in short, all that go under the name of Tapas— or austerities. The mental body must be purified and strengthened by study, by acquiring knowledge. An ignorant person cannot be a Yogi. The causal or spiritual body is to be developed by entire devotion to God. Thus an atheist cannot be a true Yogi. These three helps--austerities, study and resignation to the will of God—facilitate trance and remove "afflictions." The “affliction "is the technical name of certain intellectual and emotional weaknesses to which all human beings are liable. They are five in number: (1) The first is the Nescience or Wrong Notion of things objective•—•mistaking the non-eternal for the eternal, the impure for the pure, the painful for the pleasurable, the non-Self for the Self. (2) The second is the wrong notion about things subjective-identifying one’s Self with the vehicles in which the Self functions, taking the bodies for the soul. These two are intellectual defects. (3) The third is the emotional weakness. It is the desire natural of man, running after pleasant things. (4) The fourth also is emotional—hatred of things that give pain. Thus these two—love and hatred—are emotional defects. The fifth defect is neither intellectual nor e1notional—it is instinctive—the instinct of self—preservation—the instinctive fear of death—the love of life. These are the live "afflictions” of Yoga—Avidya, Asmita, Rage, Dvesa and Ahhii1ivesa—Nesciece, Egoism, love and hatred and instinctive dread of death. These “afflictions” are destroyed by meditation and the methods already mentioned. These "afflictions” are the root of the body of transmigration, the root of re-incarnation, of birth, life and suffering. The pleasure and pain which a man suffers are the result of his past acts; the virtuous acts are the seed of pleasure, the vicious of pain. The word “affliction" is thus a purely technical term, for it includes the high heavenly pleasure also which is the result of virtuous actions. But in the philosophy of Yoga—as well as that of Sankhya—all such pleasures are also considered as pains : because philosophically the world is painful, all its experiences, even those which people call pleasurable, are painful to the philosopher. This is stated in the memorable aphorism, ll. 15, p. 100. All world-experience being thus painful, the philosopher seeks to find the root—cause of this experience and this is the conjunction of the knower and the knowable—the Self and the not—Self. Because man is tied with mind, and cannot extricate himself from the embraces of mind—matter that he sellers. When he masters the mind, and is not her slave, then there is no pain—there is no necessary experiencing of joy and sorrow. The non-ego to which the man is tied has the three Well-known attributes or Gunas—the Sattva, Rajas and Tamas—the Light, the Activity and the Inertia—is the source of all elements, and producer of all sensations and senses. 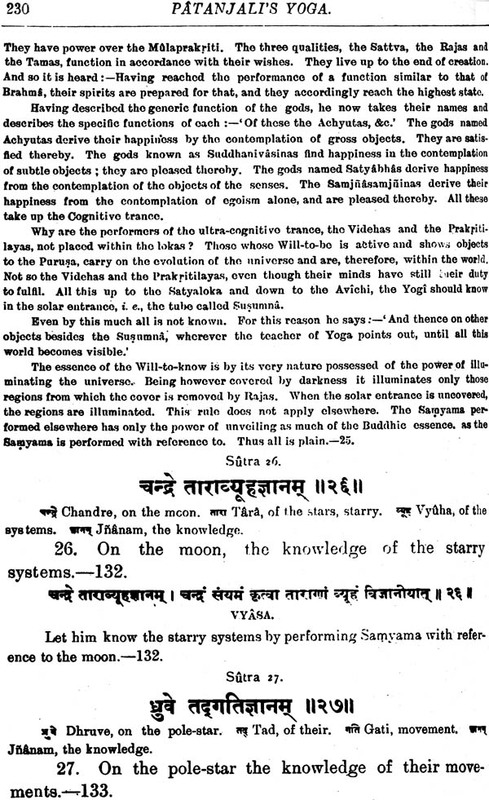 The Yoga system of cosmogony is the same as that of the Sahkhya; so far as the evolution of the world—elements out of the Primordial matter called Prakriti is concerned. It is summarised in II. l9). What is the nature of the Self? This question naturally arises after one has learned the nature of the non-Self. The man is pure consciousness: and then on self exists for him. If man is pure consciousness, how does he perceive the non-Self? He knows the non-ego by a sort of reflex action. The mind catches the reflection of the non-Self; and the man becomes conscious of that reflection. The man is thus the seer of the pictures in the mind. The non-ego or the knowable thus exists for the sake of the Man. In the state of Mukti, there exists no knowable for that Man. Though to the Perfect Man there is no knowable, it does not mean that the knowable ceases to exist. It exists with regard to the other souls that have not reached perfection. 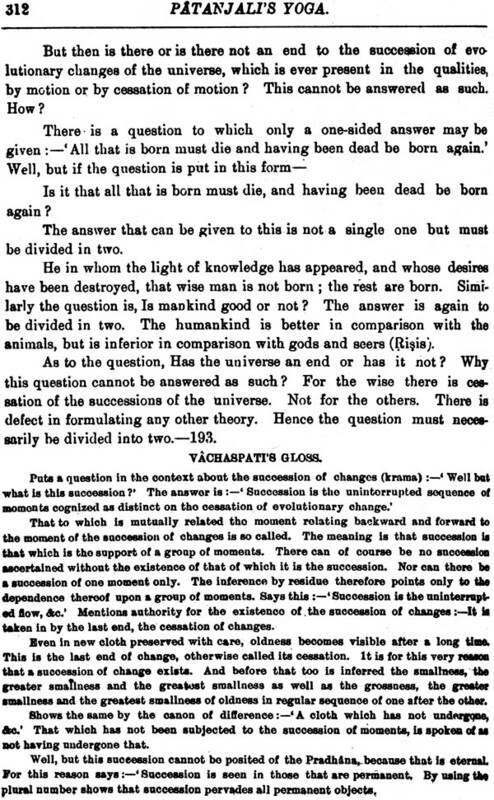 A question is often asked: If the ultimate goal is the separation of man from the non-Self, the knowable, why was this conjunction between the two brought about? Why was man tied down to none—Self, to matter• mind? The answer to this is: In order that Man may perfect his nature by acquiring all experiences and passing through them. Unless the Man learns all that the Matter—Mind has to teach, the conjunction is not broken. The effective cause of this conjunction lies in the Avidya—the Wrong Notion. When, therefore, the Avidya or Nesciences is removed, the conjunction is removed and the Man shakes off the eternal burden. How is the Avidya to be removed? The Avidya being Wrong Notion can be removed only by Right Notion call Viveka-Khyati or Discriminative knowledge. This discriminative knowledge has seven stages—four dealing with the phenomenal knowledge and three with the mental or subjective notions, as described in ll. 27. It is on reaching this that the title of Adept or Kusala is given to the Yogi. The acquisition of this Adeptship is through the practice of eight- fold Yoga. The famous phrase Astanga Yoga refers to this. The eight accessories of Yoga are enumerated in ll. 29. Five of these are external, as if, compared with the last three. The eight Angas are so important that it can well bear repetition here. First, Practise Restraint, i.e., be moral. This restraint or Yama consists of five subdivisions :—(a) do 11ot kill or injure any being. Be kind to all. Ahimsa; (b) Speak and act truth; (e) Steal not, nor acquire illicit gains; (d) Practise eontine11ce and celibacy; (e) Be not avaricious. These are universal rules. Second Niyama or Observance. This is also five—fold:- (a) Be clean in body and mind, (b) Be contented, (c) Practisc asceticism and austerity, (d) Study sacred books, (e) Be devoted to God. While practising Yama and Niyama, if obstacles arise, always try to think of the opposite quality. If he feels a strong desire to tell a falsehood, let him not fight the desire, by a frontal attack, by checking it. Let him substitute the opposite desire—the beauty of truthfulness. If he hates another, let him think of the good qualities of that man. If he is in danger of breaking the vow of celibacy, let him think of the glorious future of the Brahmachari. Pratipakasa Bhavana—thinking of the contrary—is the key of success. It is the great strategy in this moral battle, and is embodied in ll. 33. The moral qualities mentioned in Yama, must be absolutely observed—no sophistical diminution of their absolute nature is allowed to the Yogi. To him the moral laws are absolute. Thus the first rule of Ahimsa says “kill not.” This is an absolute rule. There cannot be any exceptions or reservations. The enemies of the country, the renegades of religion, the blasphemers of sages and saints, the murderer, the criminal- kill none. To Yogi the vow of non-killing is absolute. H must not kill even in self defense of himself or of his near and dear ones. 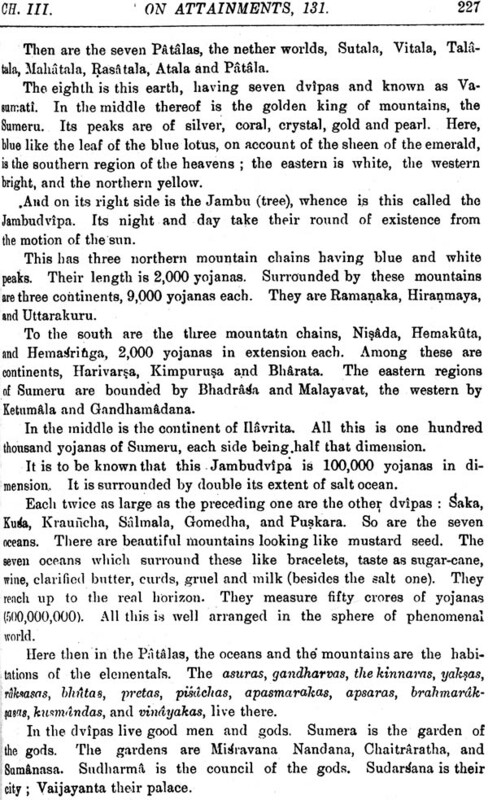 Hence the rule says” “They (Yama) are the great vow universal, and not limited by caste, country, age and condition.” (II.31). So also with truth. One must not lie for the sake of one’s country or State or Brahmana or cow, &c. Not only this: there are certain omissions which become as bad as actual commissions of these sins. He incurs sin if he causes another to do it or permits its being done.